U.S. Energy Storage Market size will exceed USD 4 billion by 2024, as reported in the latest study by Global Market Insights, Inc. Growing regulatory focus toward minimizing carbon emissions while increasing the share of renewables on the grid will drive the U.S. energy storage market size. Key states including California, Massachusetts, New York, and Oregon have adopted legally defined energy storage capacity to be integrated into the electric grid. In December 2017, the New York government introduced a new law mandating a state-wide energy storage deployment target of 1,500MW by 2025. The U.S. residential energy storage market will witness robust expansion on account of increasing penetration of solar PV levels along with introduction of supportive policies and energy storage subsidies. California and Hawaii constitute the sizeable proportion of the overall residential energy storage sector in the country with fresh participation anticipated from Arizona and Massachusetts in the near term. The industry growth is further stimulated by growing implementation of time-of-use rates by utilities coupled with reduction in net metering compensation. Lithium ion energy storage market will witness growth on account of continued downturn in battery costs driven by enhanced manufacturing capacity. Li-ion batteries are utilized in a wide array of energy-storage applications, including residential systems with rooftop photovoltaic arrays and grid ancillary services amongst others. High charge/discharge efficiency and appreciable energy density are some of the key features that will continue to boost the technology adoption over the conventional counterparts. The U.S. utility energy storage market size will exceed USD 1.5 billion by 2024. Strengthening need to build a disruption-proof grid with the implementation of increased efficiency, resilience, and sustainability will favor the industry growth. Growing concerns over climate change and aging grid infrastructure will further favor the business scenario. Increasing share of renewables in the national grid facilitated by several fiscal incentives and ventures will stimulate the U.S. energy storage market size. The share of renewable in the California energy mix has been growing exponentially, thereby supporting the industry growth. In addition, legislative mandate to increase renewable generation to achieve emissions reductions targets will positively influence the industry outlook. 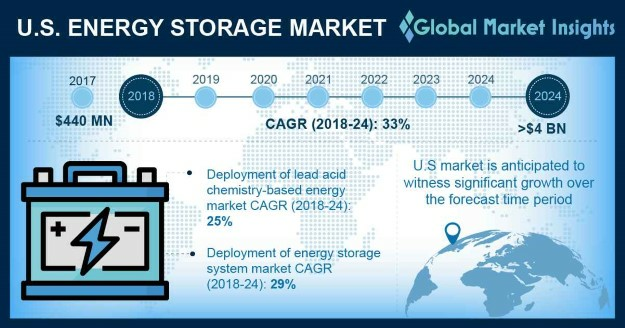 Key industry participants active in the U.S. energy storage market comprise Duke Energy, East Penn Manufacturing, E.ON, EDF Renewable Energy, GE Power, EnerVault, LG Chem, Fluence Energy, Invenergy, Johnson Controls, Tesla, SolarEdge, and ABB amongst others.